It will use up all the remaining blue (which is actually just a little lighter & "dustier" than that, a lot (but not all) of the green), both of which are Ella rae Classic yarn (blue is color #45, green is #90.) The corn yellow is Cascade 220 Superwash, color #821 (and I don't want to use much of it, because that Superwash tends to go really limp after handwashing). And the multi-colored yarn is the Bitterroot Rainbow from Mountain Colors, and is actually a bit brighter (so yes, I fiddled with the colors for the best overall realism. in natural light from the window, the green is distinctly "brighter' than the blue. For this pair, the foundation color (Color 1) is the blue--so it has the rolled edge, the "ankle" and heel flap, and will have the toe. Color 2 is the Bitterroot Rainbow, and it and the green will have almost the same amount, I think. I'm not counting the rows of each to make sure. The alternate colors are all in the wide colored band that works the gussets. I've considered making the toe stripe yellow. 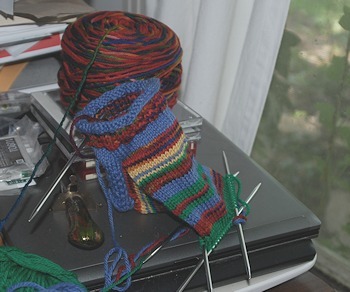 The second sock isn't on the gusset yet--the heel's turned, but I got excited about working on the stripes, so I moved ahead on A, and will pick up the stitches on B this afternoon or evening. What I don't have yet is a name for this pair. The other striped ones all have names: Rainy Day Roses, Sunshine 'n' Roses, Desert Canyon Sunset, Tropical Lagoon. But this? Suggestions will be accepted, but no promises that I'll pick one. The only think I've thought of is Summer Wildflowers (becuase the sky is the right color for Texas summer sky, and we do have some wildflowers this year, but the Bitteroot Rainbow doesn't have enough bright yellow in it, and the yellow stripes are for the other wildflowers. that are solid yellow. They're planned as solids if I have enough of the royal blue left. Otherwise the feet may acquire some stripes (but toes and heels will be blue, whatever else happens between.) Those stripes will probably be green, if they're needed to eke out the blue. Were you thinking of arroyo? Although they are mostly flowing water courses. Oh, I'm so glad those happened. First pair is amazing. BUT--if I combine colors of leftover yarn, then a) I can hide the slight difference between dye lots by putting a stripe of something else in between, and b) stretch a favorite (or more expensive) color across multiple pairs of socks by using 3 or 4 colors per sock. The Mountain Colors yarns are much more expensive than the yarns I usually buy...a pair of socks made only of Mountain Colors yarn would cost roughly 4 times what my other socks do. 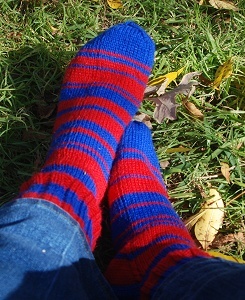 But using a Mountain Colors yarn as a stripe yarn means I will get many pairs of socks enhanced with that yarn. Also, to try out a new yarn, when I know it's more than enough for a whole sock, a few stripes let me learn about the new yarn without reducing its utility as a solo yarn. So far, when I've combined yarns from different manufacturers in these shorty socks, the socks have washed and worn as if they were all the same, even though they aren't. Someday I'll try one that does not work in combination...but until then, it's a lot of fun to play around with them. I would not mix the Herdwick yarn with any other, except I'm going to try putting in a single row stripe near the top to help keep pairs together and wear even across the pairs...the Herdwick is all natural mottled wool color, so keeping in mind which pair I wore last time would be difficult without a mark on the socks themselves. You've got this yarn-mixing to an art. I think the mountain colors-only socks will be delightful, but do enjoy the textures and colours in these recent pairs. My first thought was that since there's more green than yellow it seems more like a field with a scattering of flowers or grain so Summer Meadow or Open Field or Plain. Following up on this Painted Canyon since to me it looks like the beautiful stone patterns you see in canyons with hint water & plant life in it.